In a high-scoring back and forth battle, the Checkers fought their way back to pick up an overtime win against their Central Division rival Cleveland Monsters. After the Monsters broke through in the first, the two clubs traded tallies over a whirlwind two minute stretch, with Andrew Poturalski and Patrick Brown pulling the score even through 40 minutes of play. The visitors responded with a pair of strikes in the third to build their first two-goal lead of the night, but the Checkers wouldn’t relent. Just 19 seconds after Cleveland’s fourth goal, Levko Koper kept a loose puck alive behind the net and banked it in pull Charlotte back within one. Then it was Brendan Woods, back in the lineup after a 45-game absence, who tied things up, ripping a wrister that beat Monsters’ netminder Anton Korpisalo short side less than a minute after that. Neither side could pull back ahead in regulation and the contest moved to overtime. The Checkers wasted no time in the extra frame, with Poturalski and newcomer Danny Kristo springing out to a 2-on-1 where the latter would set up the former for his second of the night to lift Charlotte 5-4. Charlotte now trails Cleveland by three points in the standings with one game in hand. As of tonight, the Checkers would have to catch both Cleveland and Iowa to make the playoffs … Poturalski extended his point streak to seven games (4g, 5a), which ties the longest by a Checker this season (Brock McGinn). His 37 points are the third-most by a Checkers rookie in a single season (Zac Dalpe, Victor Rask) … Charlotte improved to 16-6-1 on home ice this season … The home team has won all five games of the season series between Charlotte and Cleveland thus far, with the Checkers taking the last three … Forward Danny Kristo and defenseman Philip Samuelsson made their Checkers debuts after joining the team via trades earlier in the week … Sergey Tolchinsky (nine games missed) and Woods (45 games missed) both returned from injury … Forwards Patrick Dwyer, Kyle Hagel and Mitchell Heard and goaltender Michael Leighton missed the game due to injury … Forwards Bryan Bickell and Erik Karlsson were healthy extras. 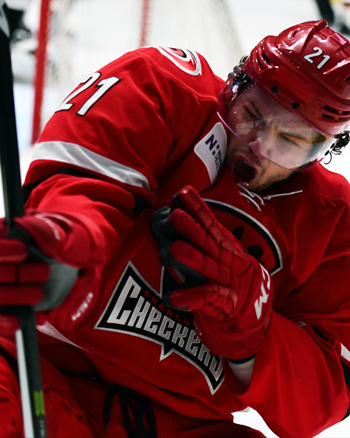 The Checkers will continue their six-game home stand with a rematch against Cleveland tomorrow night at 6 p.m.